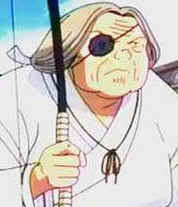 Bio: Kaede is Kikyo's younger sister and assists her with various tasks such as gathering herbs or holding her arrows. After Kikyo's death, Kaede becomes a miko in her own right and defends the village against demons. When Kagome arrives, Kaede recognizes her as the reincarnation of Kikyo. After Kagome frees InuYasha, Kaede puts the "Beads of Subjugation" onto him to give Kagome the power to control him with a spoken word. Kaede is well-respected and held in high regards by the villagers and the members of InuYasha's group, which she often advises about demons and other spiritual anomalies. Though InuYasha is easily annoyed with her, he listens to her when necessary and doesn't hesitate to protect her from a threat. Kaede loses an eye sometime during her life. In the manga, her eye appears to be freshly bandaged and bleeding shortly before Kikyo's death, suggesting that the wound occurs when "InuYasha" (really Naraku in disguise) attacks the village to steal the Shikon Jewel; supplementary information states that she "lost her elder sister and her eye in an incident fifty years ago." The anime simply says that she lost it during a demon attack on the village. 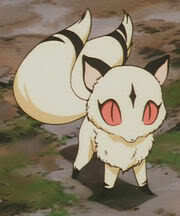 Bio: Kirara is Sango's faithful demon-cat companion. Kirara usually appears to be a small kitten-sized feline with two tails, but can become large enough to carry several passengers (usually Sango, Miroku, and Shippo). Her full-sized form has more prominent fangs, flames around her feet and tail, and enough power to fly through the air fast enough to keep up with InuYasha's top speed. At the end of the series after Naraku's defeat, she joins Kohaku as he trains to become a demon slayer while Sango starts her new life with Miroku and their children. The anime series suggests that she was once the companion of Midoriko, the miko who created the Shikon Jewel. 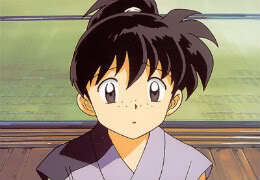 Age: 11 Kohaku is the second of the only two people whos ages are revealed, Kagome is the first. Bio: Kohaku (琥珀?) 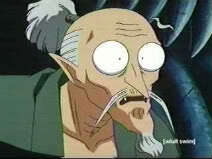 is Sango's younger brother. Disguised as the young nobleman Kagewaki Hitomi, Naraku summons Sango's family and companions to slay a false demon, then controls Kohaku with a Shikon shard and makes him kill all of the other demon slayers (Sango survives solely by sheer luck). Castle guards also kill Kohaku that night. Naraku resurrects him as an amnesiac puppet, but after several encounters with Sango and her friends, Kohaku begins to recover his painful memories. Kagura helps him escape from Naraku, who kills her for the defection. Hoping to redeem himself, Kohaku travels with Kikyo until she tells him he must leave her to keep his shard pure. 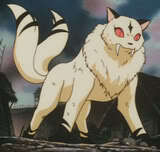 He later joins Sesshomaru's group and becomes Rin's friend and co-protector. In the last chapter of the manga, Kohaku goes with Kirara and a new demon-slaying weapon which Totosai made for him. When Totosai asks him if he will visit his sister Sango, he replies that he will not, since the house is getting too crowded. Bio: Totosai is an elderly blacksmith demon who forged Tetsusaiga and Tensaiga from the fangs of his old friend, The Great Dog Demon, who entrusted him to help his two sons. As InuYasha grows stronger and Sesshomaru grows more compassionate, they become more capable of mastering their respective swords, which Totosai strengthens accordingly. He spends most of his time at his forge inside a volcano, but sometimes travels elsewhere on a flying three-eyed ox named Mō-Mō. Totosai often appears to be a cowardly, absent-minded old man, but he is strong enough to pause an attack from Sesshomaru long enough to allow InuYasha to get away; he can breathe fire and his giant forge hammer can open large fire pits in the ground. At the end of the series, he continues his role as a blacksmith as seen when giving Kohaku a new weapon. Bio: Myoga is a flea demon who appears randomly and gives InuYasha information on current events, foes, and the shards of the Shikon Jewel. Assigned to protect Tetsusaiga's hiding place in the grave of InuYasha's father, he runs away when Sesshomaru comes there in search of the sword. Myoga often flees before or during a battle, which the others recognize as a sign of pending danger; his mere presence in any area is enough to determine its safety. Myoga enjoys drinking demon blood, and actually saves InuYasha's life at one point by drinking a spider demon's venom out of his blood. He can save the others in a similar manner, but often gets slapped for drinking their blood without permission. In the anime series, he is engaged to another flea demon named Shoga, but continually runs from her to avoid the marriage.